Teddy is my standard poodle. He lovingly and famously became known as Dr. T. when I had breast cancer, and a true healing doggie doctor he was. 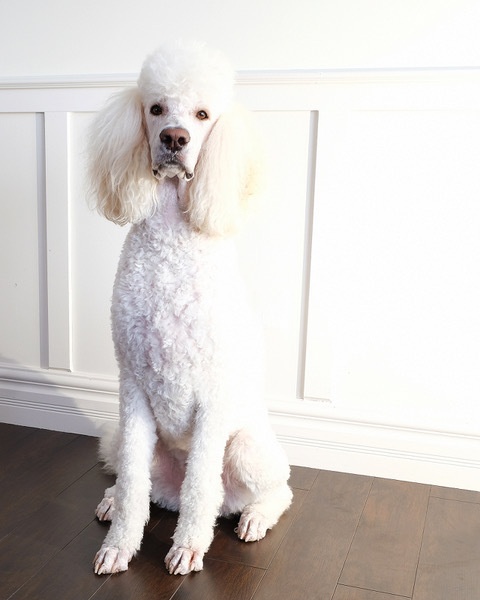 Born on March 25, 2013 to two Phantom coloured (a black/silver Mom and black/cream Dad) Standard Poodle parents, Teddy came out as a beautiful dreamy cream in a small litter of three. Standard poodle, Teddy Johima, Doctor Theodore (Dr. T.) was my Chief Medical Officer. As my personal assistant, he helped me kick Breast Cancer Out! … he was by my side when nobody else was there. Dr. T. behaved as a RockStar in every hotel that he and I stayed in during cancer treatments, often garnering line-ups of humans who wanted to say hello. He was a great distraction from physical pain, and made me laugh every single day! I would define Teddy as … A Counter Surfing Professional with an A+ Status, a Sock Stealer Extraordinaire, Intuitive Healer, Underwear Grabber, Yummy Food Shoplifter, Happiness Maker, JOY Builder, Mud Puddle Lover, Cancer-Kicker-Outer, and all around FUN Guy. What are Teddy’s favorite activities? Swimming in the ocean, playing fetch outdoors, chasing a soft frisbee indoors. He has a huge obsession with soccer balls (and could beat Beckham), squeaking squeaky toys as loudly as possible and for as long as possible, running free on the beach, sniffing everything, counter surfing, stealing socks, underwear and shoes … and … in past, helping me, Kick Breast Cancer Out! Now that I am cancer free, Teddy and I spend as much time together as possible outdoors in nature, making the most of our precious time together on this beautiful planet.